The NM100 system is a full-function intercom and music distribution system designed for retrofit applications in residential use. The ‘Master’ unit can replace older intercom systems that use three-wire or four-wire connections to the room stations. The system supports up to 15 remote stations when retrofitting a 4-wire system, and 13 remote stations when retrofitting a 3-wire system. 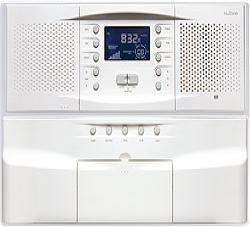 The built-in AM/FM radio tuner allows setting eight AM station presets and eight FM station presets. The backlit liquid crystal display shows the operation mode, audio source, radio frequency, volume setting, and time. With the optional NC300 6-disc CD changer installed, the display shows the disc number selected and the track number currently playing. Remote stations have pushbuttons that control the system operation. Retrofit indoor and outdoor remote stations connect to the ‘Master’ unit using the installation’s existing wiring. All 4-wire remote station models can select ‘talk’ or ‘listen’ to other remote stations, door speakers and the master unit. 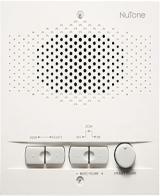 The 3-wire models can select ‘talk’ to other remote stations, master unit and ‘talk/listen’ to door speaker. Each has an intercom volume control. The NRS103 and NRS104 indoor remote stations and NPS103 and NPS104 outdoor remote stations can select the audio source, scan preset radio stations and set the master music volume.